In November, the Los Angeles City Council named Armet & Davis’ Johnie’s Coffee Shop, the restaurant at the corner of Wilshire and Fairfax, a historic cultural landmark. That’s a win for preservationists concerned with the legacy of the Googie style, the auto-oriented, steel-and-neon aesthetic that spawned diners and coffee shops across Southern California from the 1940s through the 1960s. It might also give a leg up to locals interested in seeing Johnie’s returned to its original use. Because Johnie’s Coffee Shop isn’t a coffee shop, and hasn’t been for over a decade. Since 2000, it’s been closed to the public and used exclusively for filming. The restaurant’s film credits, both before and after its conversion to a 24/7 theatrical set, include The Big Lebowski and Reservoir Dogs. But while the best use for a building like Johnie’s might have a stronger community orientation, in the meantime its co-optation by the film industry isn’t all bad. 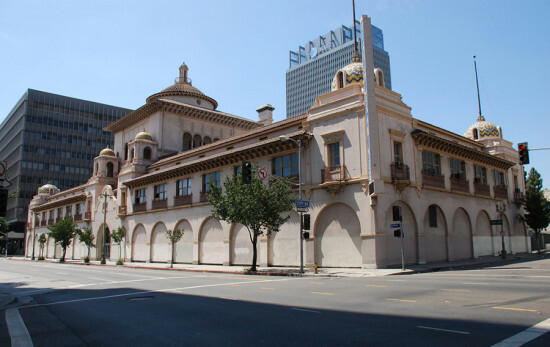 When it takes over a building, the film industry buys time for preservationists and others hoping to breathe new life into an under-used landmark, Adrian Scott Fine, Director of Advocacy at the Los Angeles Conservancy explained. “It’s kind of an advantage that Los Angeles has over other cities,” he said. In addition, “People discover buildings through film,” Scott said. “Johnie’s, some of the films it’s been in, it’s clearly the star of the film.” Approximately two years ago, the Los Angeles Conservancy honored Mad Men and its creator, Matthew Weiner, for the way in which it showcases midcentury modern architecture. Weiner has been active in efforts to preserve Los Angeles landmarks, Fine said, and the show has featured preservation-themed plot lines, including the demolition of New York’s Penn Station. 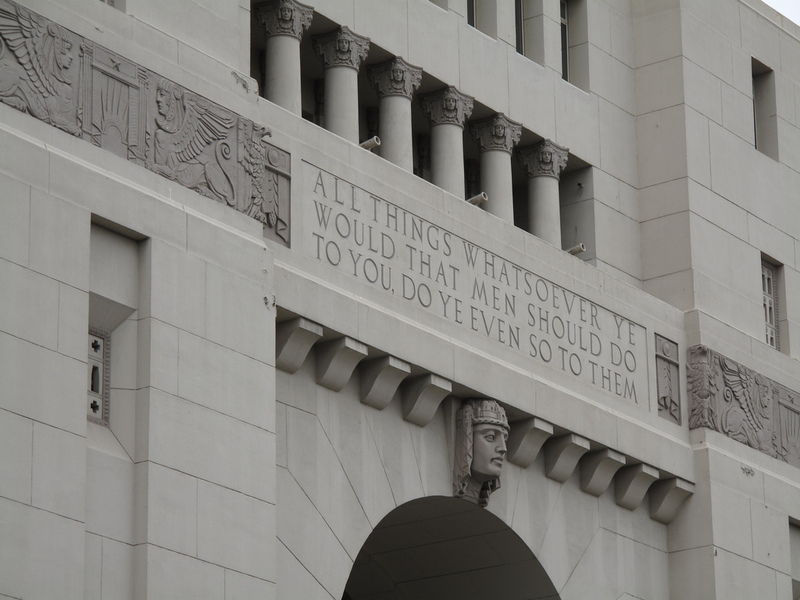 This all got us thinking: what other LA architectural landmarks are now used primarily as stage sets? The answer, it turns out, is quite a few. From one of Julia Morgan’s earliest Hearst commissions to a 1958 Pereira & Luckman high-rise, here’s our list of Los Angeles masterworks currently in the hands of the film industry. Media magnate William Randolph Hearst commissioned 2014 AIA Gold Medal recipient Julia Morgan to design a new headquarters building for the Los Angeles Examiner newspaper in 1913, ten years after the paper’s founding. When the Herald Examiner, the Los Angeles Examiner’s successor, went under in 1989, the Hearst Corporation held on to the structure. In 2008, Brenda Levin (who cites Julia Morgan as her role model) was set to renovate the building—but then the economy tanked. Plans to rehabilitate the building, and build two Morphosis-designed residential towers adjacent to it, were put on indefinite hold. 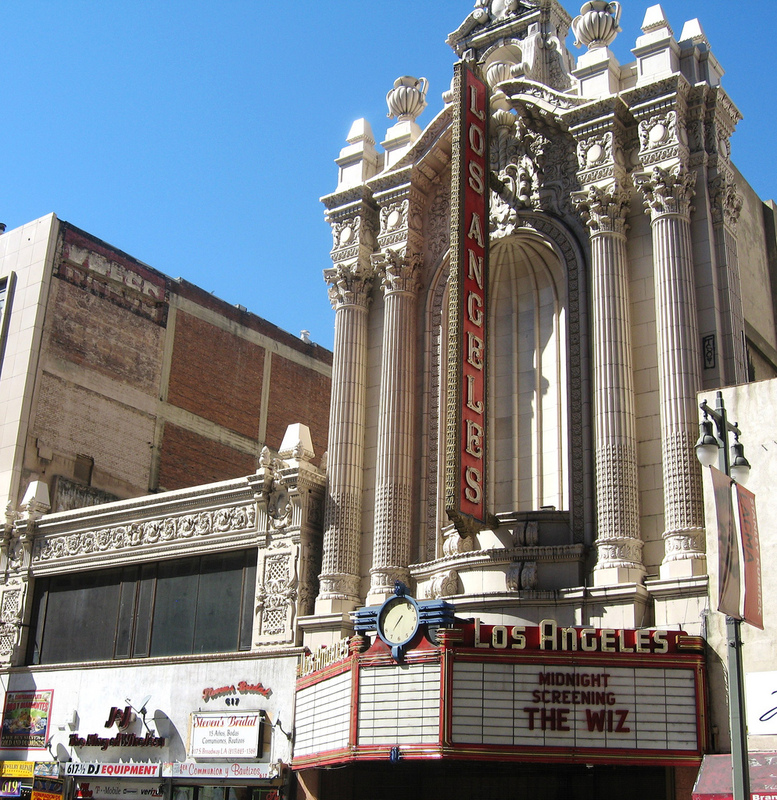 Today, the Herald Examiner building is used exclusively for filming. Scenes in The Usual Suspects, Dreamgirls, Spider-Man 3, Zoolander, Castle, Bones, and It’s Always Sunny in Philadelphia, plus music videos by Eminem, Shakira, and Christina Aguilera were shot there. Interior location sets include an apartment, bar, jail, and police station. Art Deco and Corporate Moderne architect Claud Beelman designed the Park Plaza Hotel as Elks Lodge No. 99 in 1925. During the 1932 Olympics, the building hosted several indoor swimming events. The Park Plaza, which is listed as a Los Angeles historic-cultural landmark, features four ballrooms: the Grand Ballroom, whose decorated ceiling beams were modeled after a palace in Florence; the Art Deco Terrace Room, formerly the Elks Lodge meeting room; the Bronze Ballroom, distinguished by its copper-gilded columns; and the smaller Gold Room, named for the gold-leaf detail on its Corinthian columns. 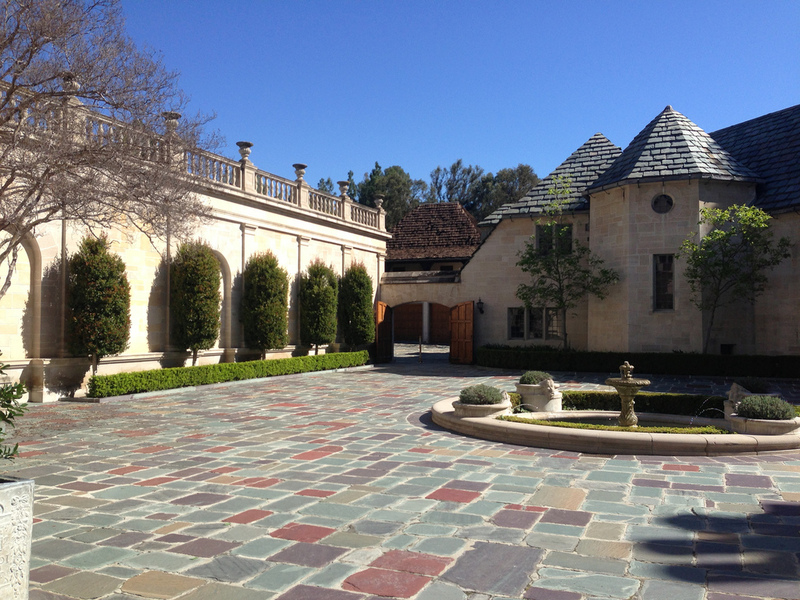 Both indoor and outdoor spaces, including the Tuscan Patio, can be rented for filming, weddings, and other events. The lavish Beverly Hills estate known as Greystone Mansion was designed by Gordon B. Kaufmann beginning in 1925 for Edward Laurence Doheny, Jr., son of Los Angeles’s original oil magnate. Kaufmann, who would go on to design both the Hoover Dam and the Los Angeles Times building, designed the fifty-five room mansion in the Tudor style. The estate gained notoriety soon after construction finished, when Doheny, Jr. was found dead of an apparent murder-suicide. The City of Beverly Hills purchased the property in 1955, and built a reservoir on the site. The grounds of the mansion are open to the public, while the interior is available for filming and events. Greystone Mansion is featured in movies including The Muppets, The Social Network, What Women Want, Air Force One, and Ghostbusters. 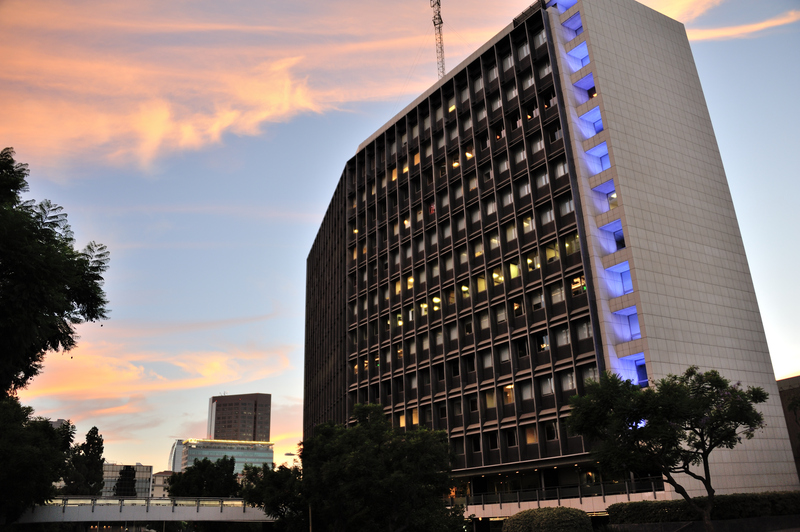 When the Los Angeles Center Studios’ original tower, designed by Pereira & Luckman, was completed in 1958, it was the tallest structure in downtown LA. Hexagonal in shape, the International Style building is entirely unornamented, except for the aluminum sunshades at the base of each window. By 1998 the building, which was originally designed as part of Union Oil’s headquarters, was threatened with demolition. A group of developers bought the complex and converted it into a full-service TV, film, and commercial production studio. The Pereira & Luckman tower is now dedicated to entertainment and creative office space.